For some reason, curious crimes and legislation tend to revolve around bathroom-oriented matters. Here are some of the biggest stories that popped up on news feeds this week. One almost feels like a retelling of a tale we've grown all-too familiar with, while the next puts a bureaucratic spin on the age-old debate about where it is and isn't okay to relieve oneself. According to Southeast Wisconsin police who spoke with ABC News, a suspect known for wearing a backpack, jeans, a black jacket and a black knit cap has been identified as the main suspect in a string of toilet valve thefts. The handles from toilets and urinals have been vanishing from fast food restaurants like Arby's, as well as colleges such as the University of Wisconsin Milwaukee, ITT, the Waukesha Country Technical College and others since September. "This is the first time we've ever experienced this or even heard of it. As you can imagine, initially it was a little bit odd," a representative from the police told the news source. "But as we found out that there were more and more thefts that were occurring it became quite serious." Police went on to state that they believe the suspect is selling the valves, as they doubt thesewould be of much value as scrap. A story that recently appeared in the Denver Post details ofa controversy it describes as "PeeGate." At the Colorado State Capitol building, many of the unmarked restrooms state officials had grown accustomed to using, without warning,requireelectronic passes for entry. Formerly, they only needed a numerical code that had gone unchanged for as long as officialscould remember. The news source goes on to explain that the legislators were not informed in advance that their favorite bathrooms would be locked due to a miscommunication with the Department of Personnel and Administration. House Speaker Mark Ferrandino balked at a suggestion that staffers and aides should not have access to the electronically locked bathrooms, noting that legislators often need their assistance at extremely short notice. That is to say, they're greatly inconvenienced if their right-hand man has to run up a floor to use the bathroom. 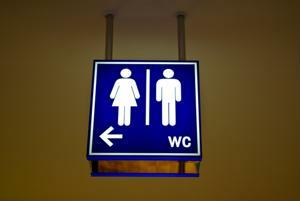 As of now, more bathrooms are available to government officials and policy makers, according to the Denver Post. "This was just bureaucratic pigheadedness," lobbyist Ben Waters said to the news source.